Well, here are some of the photos of our terrific MC Beaton signing and launch of Agatha Raisin: Hiss and Hers. Better ones to come from Joe and Lin who know how to work their camera! PS Guess what I'm having for lunch. No, not the cake - more quiche! 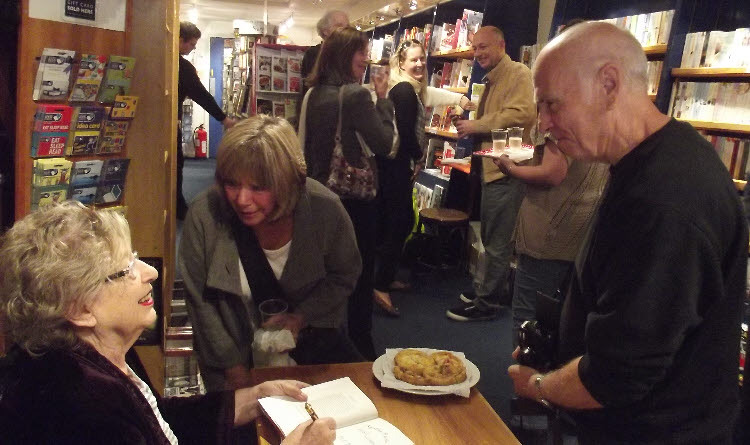 A totally mad hour and a half with lots of lovely friends, old and new, in to see Marion. 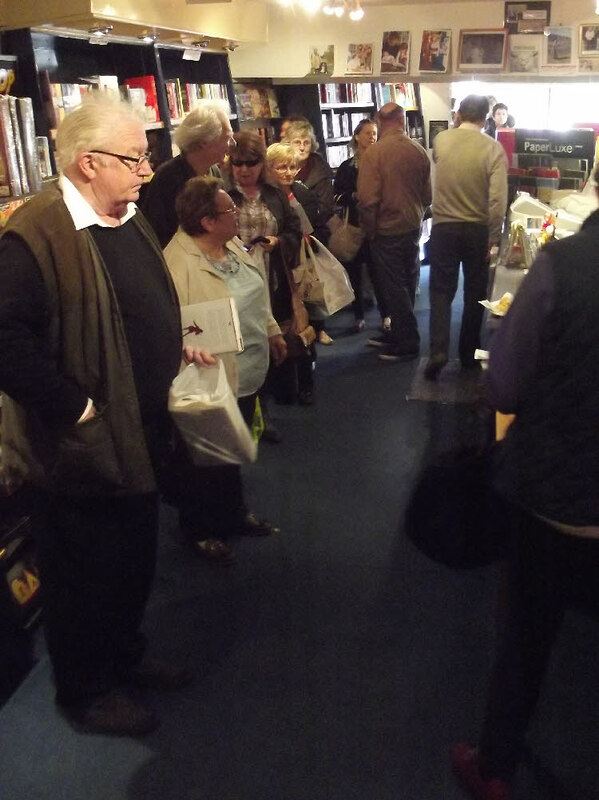 Our entire stock has gone (22 copies failed to arrive in the week) and we have many double sold. Marion will be calling in next week to sign the late arrivals though most of the postal ones have been done. Photos later, many by good friends Joe and Lin. A perfect day for our Agatha Raisin: Hiss and Hers launch today and a queue is already forming. 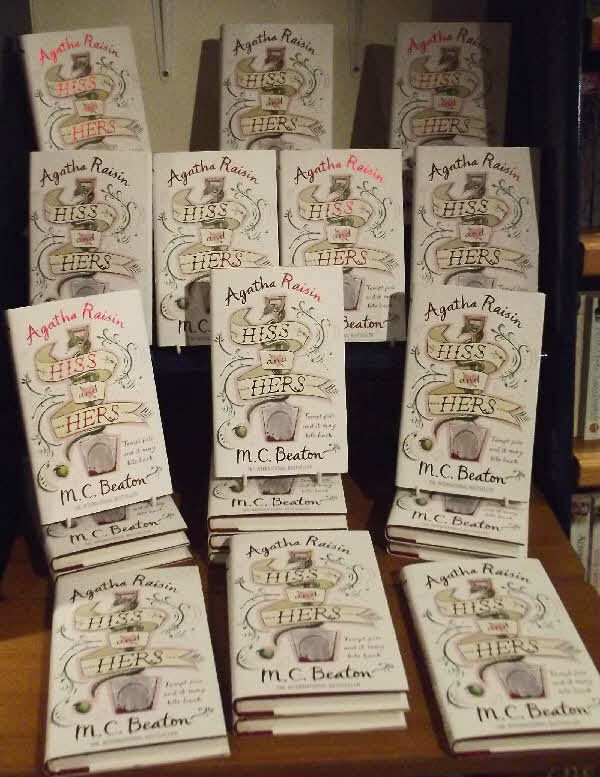 The author, MC Beaton, is due at 10.30 and there's a pile of books waiting for her signature. Meantime, David had tweaked the window with a little notice. 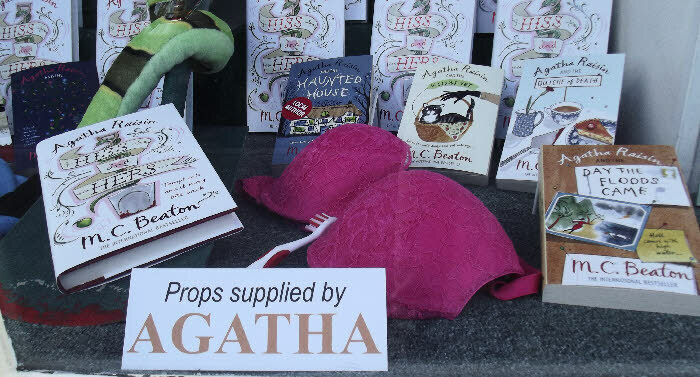 I think the word 'Props' needs inverted comma's to give the joke two layers but perhaps you'll work that out for yourself. 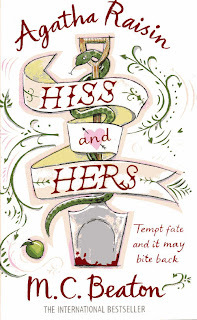 Hiss and Hers, Quiche and Wine. 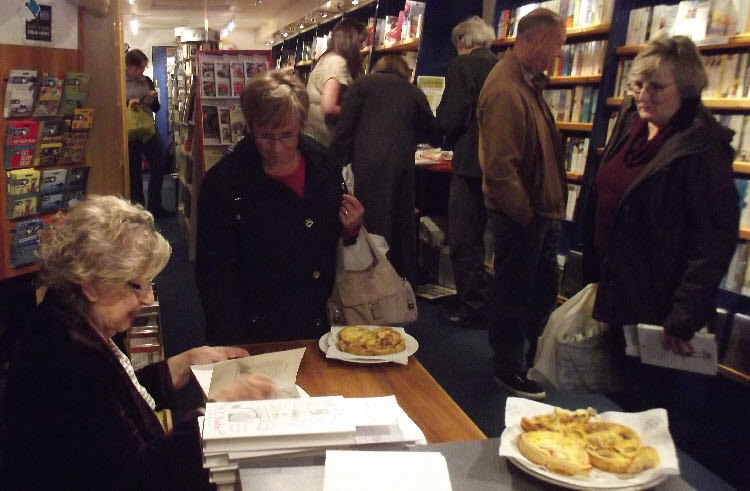 Don't miss the MC Beaton book launch and signing tomorrow at 10.30 am. 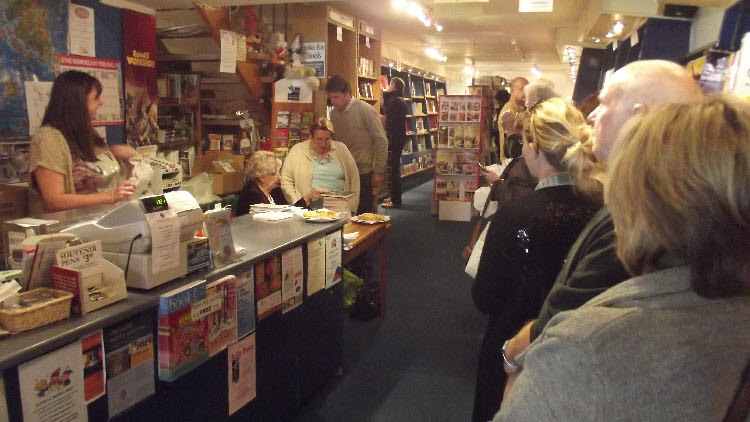 Here's our internal show-stand for the MC Beaton signing. A nice jacket, don't you think? It certainly looks good in the window though some sunshine would help. Well, only 5 days from our signing for the new Agatha Raisin title, Agatha Raisin: Hiss and Hers. 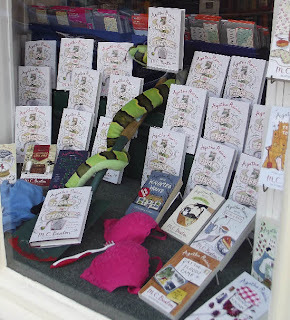 45 books finally arrived yesterday afternoon and we had fun putting the window together. but thought one by the bra' a bit too naughty for the good folk of Moreton-in-Marsh. Don't want a visit from the Vicar! 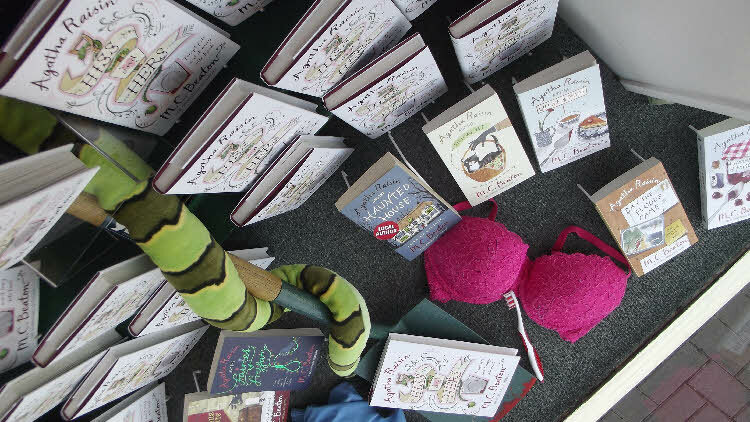 Here's a view from above showing the spade, snake and undies to good effect. Still looking for a green apple though. 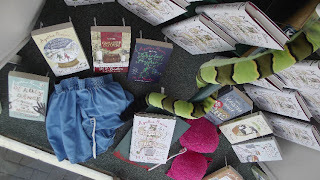 We're already having massive interest so we have another pile of books coming later in the week. 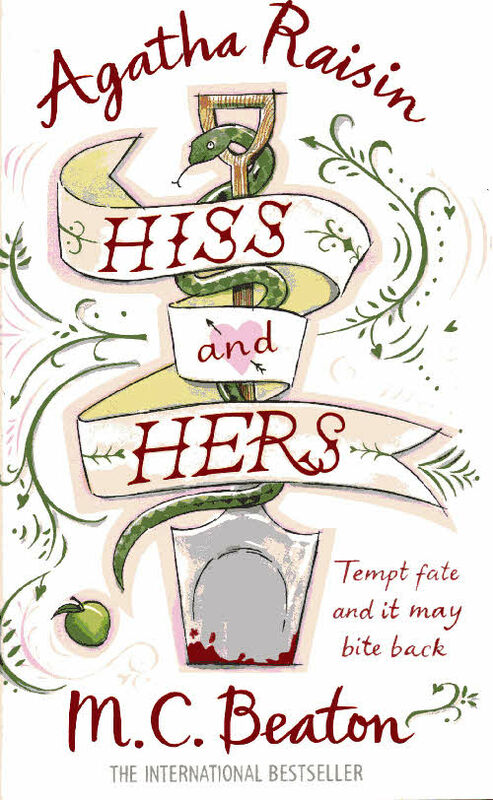 Next up - Agatha Raisin: Hiss and Hers. 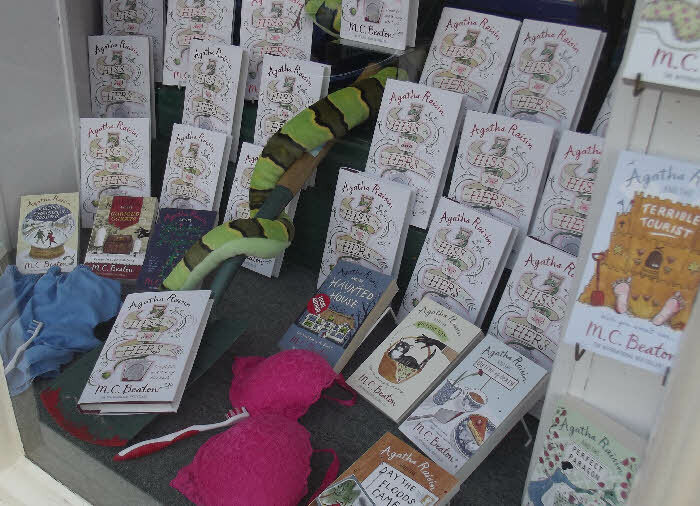 The launch of the 23rd Agatha Raisin novel and the 20th anniversary of the first will be held at Cotswold Bookstore on Saturday 29th September! Marion is due to arrive at 10.30 am and we will try to hang on to her as long as possible. However, you would be advised to get here as early as you can as we expect a crowd. As promised and only a day late. 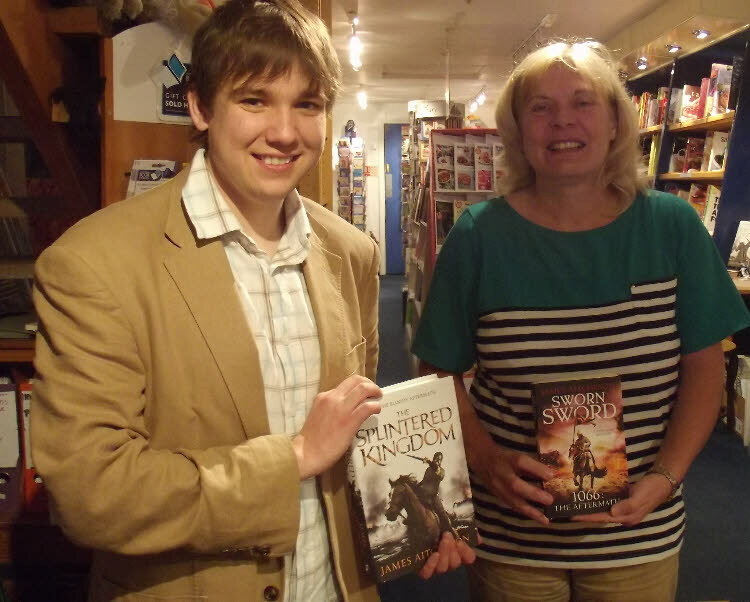 Two authors for the price of one on this Saturday morning from 10am (ish). Mathie has created an unusual style of narrative, half storytelling, half fact which makes for an interesting and often disbelieving read. The true tale of a visiting UK government worker, Desmond, sent to Africa to check up on some erroneous accounts from one of the humanitarian projects, allows Mathie to act almost as tour guide for the reader, introducing you to life in rural Africa in the 1970s. Witchcraft and the complex social nuances of the small West African community play centre stage in this book, leaving the supposedly more important tale of murder and corruption that Desmond was originally sent to investigate, in the wings. Once you realise that only the bare bones of the corruption story will be shared, you can sit back and enjoy the, sometimes sad but more often humorous, tales of village life – the description of the locust swarm remaining particularly vivid. 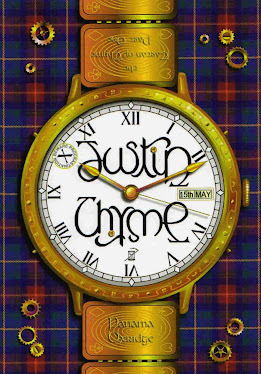 Having spent some time in rural Africa myself, I reminisced fondly over Mathie’s descriptions of the culture of haggling over everything and the pretence at bureaucracy that means getting anything done either takes forever, or a bribe, or both! 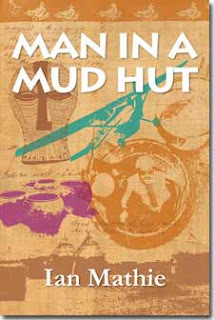 Once you get used to the unusual writing style, for those readers not lucky enough to have experienced Africa, reading Man in a Mud Hut will give you a taste of the differences, and occasional similarities to western culture which make it such a wonderful place, although much of it may seem unbelievable! For once, I didn't write the review. 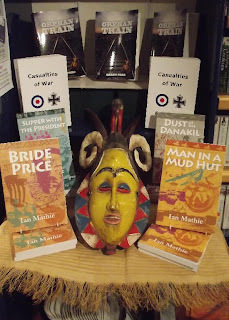 We have a showy display for Ian Mathie and Brent Ford inside the shop too, thanks to Ian providing the mask. We'll ask his for its origins when he comes in. Meanwhile, David is tweaking the window and adding a toy rifle to his Stetson and six-gun. Oh! 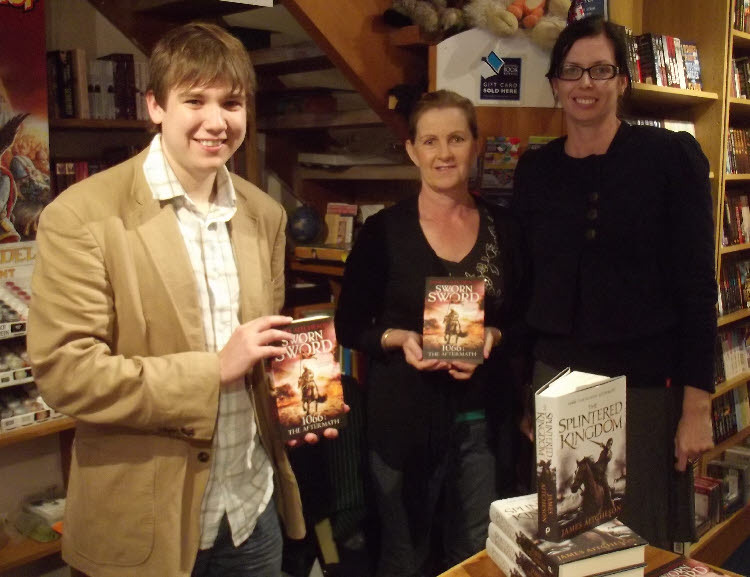 And there was another photo from Saturday that I missed from the blog. These young ladies from The States are Debbie Abel and Sharon Hutson. 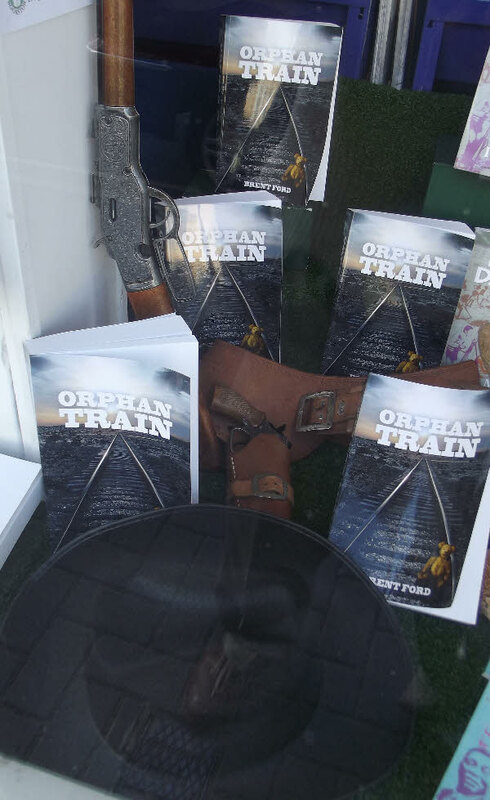 I arranged a hasty window on Sunday morning with some changes due once David fetches in his Stetson and his six-gun. The new window contains books by our TWO authors coming this Saturday morning. 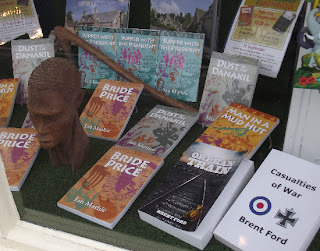 First it's Brent Ford with his Western, Orphan Train and his unusual novel set in the war years, Casualties of War. 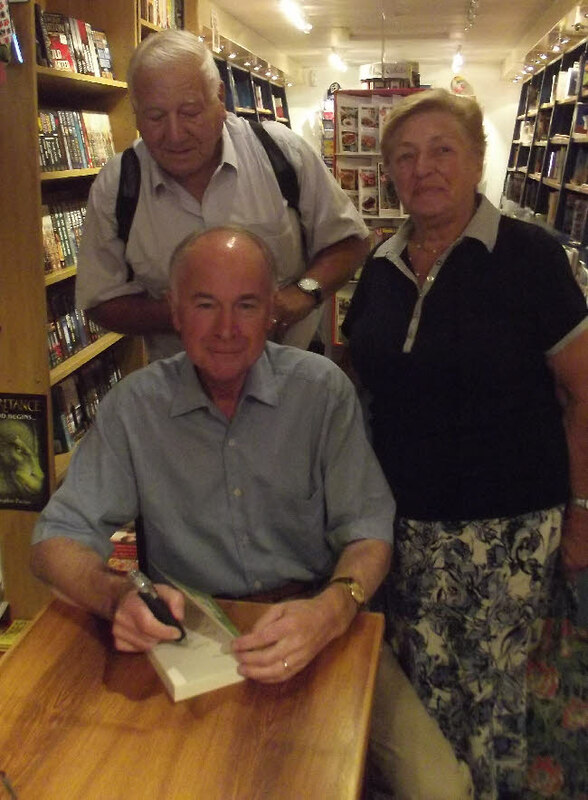 Then we have Ian Mathie with four books of his experiences as a water engineer in the Africa of the 70s. 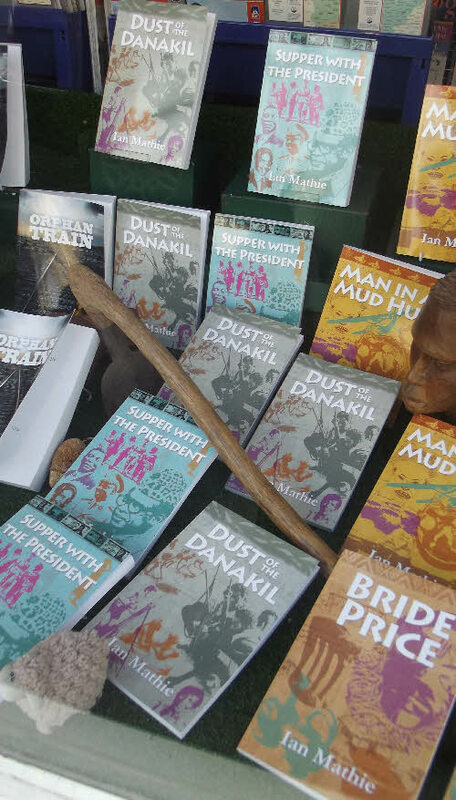 The titles are Supper with The President, Man in a Mud Hut, Dust of the Danakil and Bride Price. This latter I have read and enjoyed. A hurried post as the home computer has a fault meaning I can only up-date the blog from work. On a Sunday, that means after work and a meal is waiting! However, hopefully I can include a few photos of our James Aitcheson signing and report that it was an excellent day all round. Over 30 books sold is a good result, for us. I hope it was for James. I may be able to include more photos later. 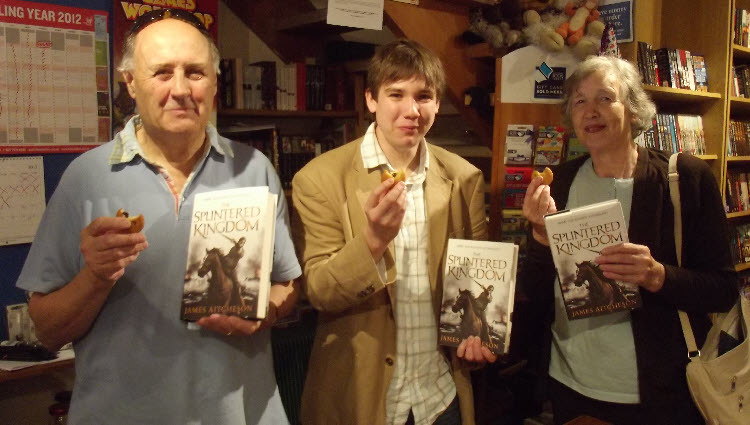 Here's David and Betty, pleased with their purchase and demolishing a honey cake each. WOT! No post on the day before our signing? Obviously trouble with our home computer where all the creative work is done. No worries. 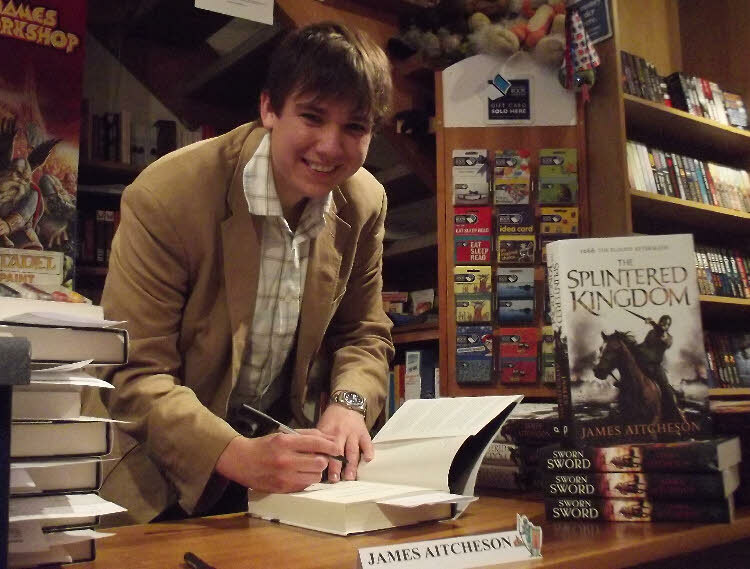 Here at Cotswold Bookstore we await the arrival of James Aitcheson. 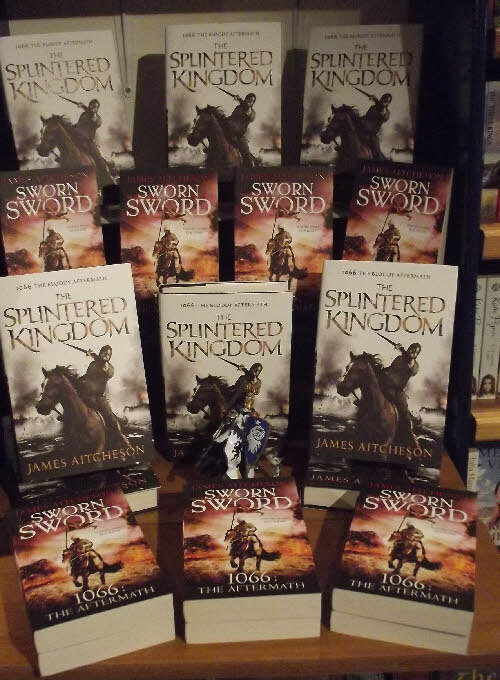 We're pleased to say that the other pile of Splintered Kingdom and Sworn Sword arrived yesterday so we should have enough for everybody. However, this is not the case with the Honey Cakes. Strictly first come, first served! Note that the word 'honey' is in caps. OK. You give in. 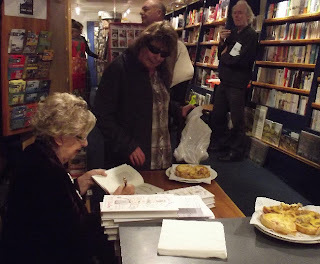 That's Marilyn's shopping list for the cakes she's cooking for our James Aitcheson signing on Saturday. We figured that Norman knights might like a drop of mead and that honey buns might also be on their menu. 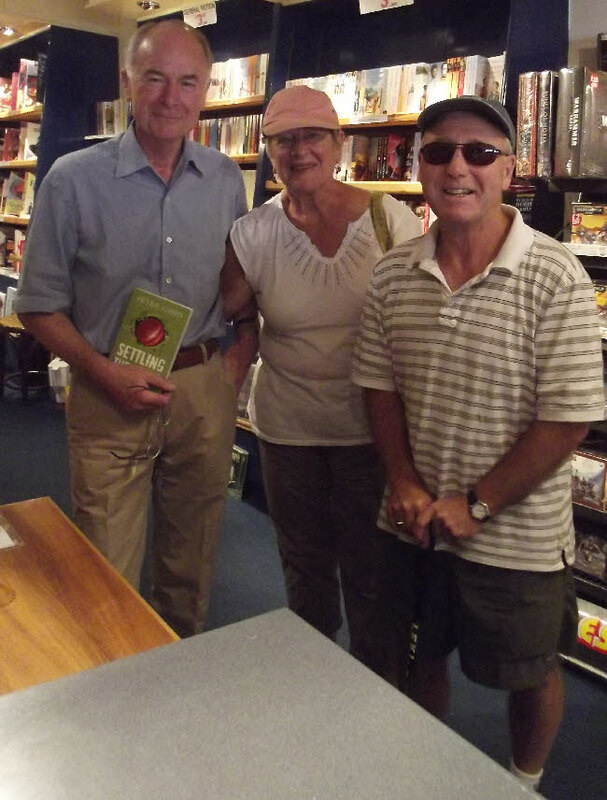 Peter Gibbs was kind enough to call in today and sign most of the remaining stock of his excellent cricket novel, Settling the Score as the signed copies were nearly sold out. So, if you missed the signing and would like a signed copy, do look in soon. 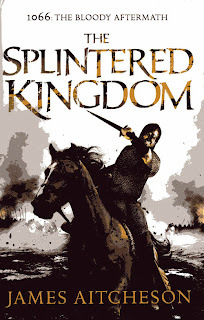 The Splintered Kingdom and the paperback Sworn Sword have taken off so I've had to order another 10 of each. Don't want to run out on the day of the signing do I! James Aitcheson would never forgive us. Especially after his complimentary comment about our window. We're looking forward to seeing him again. 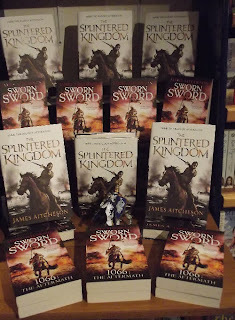 A great deal of interest already for James Aitcheson's books, both the paperback of Sworn Sword and the new hardback, Splintered Kingdom. ERROR. On some of our flyers and even on this blog, I have put the price of Sworn Sword as £7.99. It is, in fact, only £6.99! 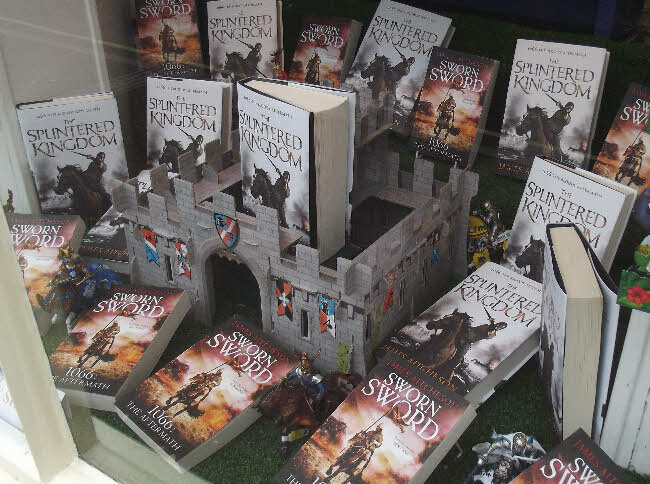 Here's our interior display for the books with one spare knight as its centerpiece. I know, I know. In the immediate aftermath of 1066, they'd not have castles like this. The knights have arrived early too. But, hey! The window looks good doesn't it? Don't forget, if you can't make the signing, we'll put a copy of either book aside for you. 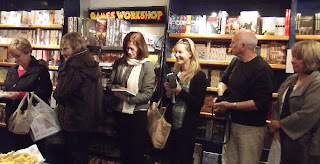 We're not set up for internet trading but if you need a signed copy posted to you, just mail us at cotsbookstore@tiscali.co.uk and we'll sort something out. Here's the jacket of James Aitcheson's new book. 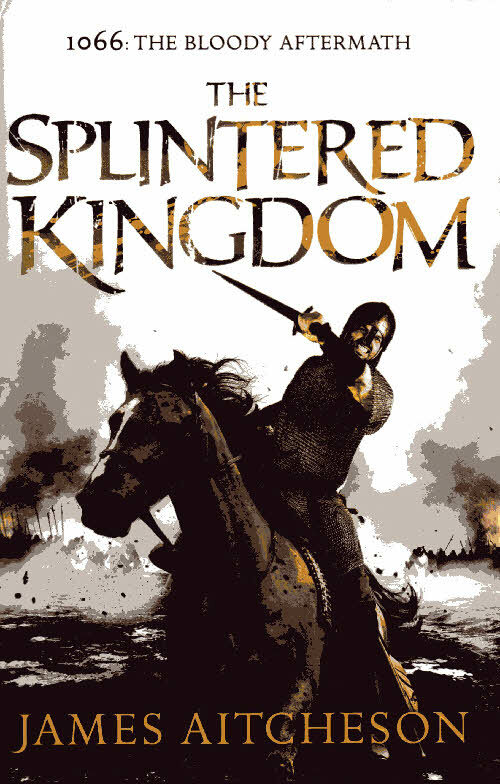 I've only had time to dip into Splintered Kingdom but I can say that it starts at a cracking pace with Tancred, now in command of his own manor, setting off in pursuit of a gang of thieving Welsh. The attackers have made off with some women and girls from a village on Tancred's estate and he has to take revenge or lose face in the eyes of his new English serfs. 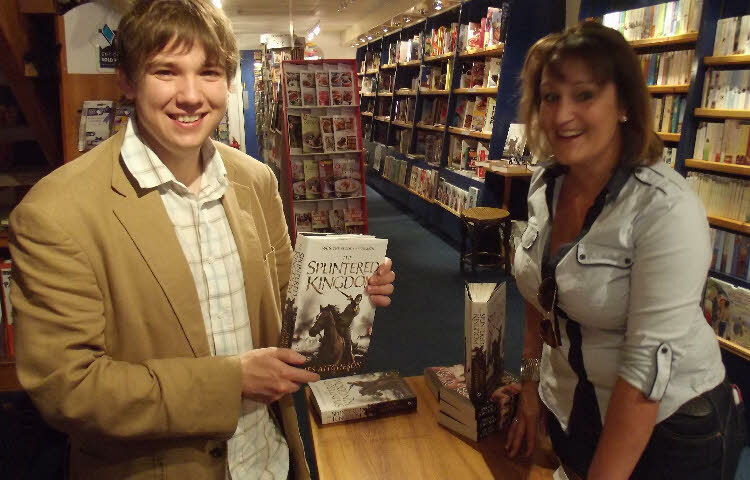 His Sworn Sword was a great success last year and is now in paperback at only £6.99. 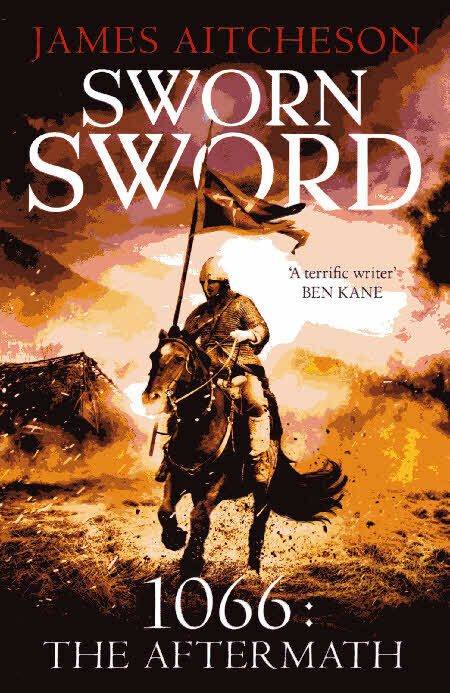 This debut novel has the subtitle ‘1066: The Aftermath’ so that’s the first thing that makes it unusual - it covers a period largely ignored. The second is that it is told from the Norman viewpoint. 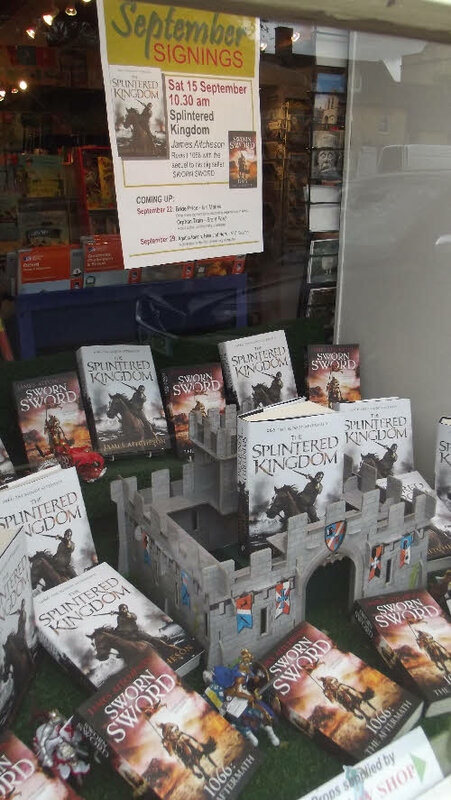 Tancred a Dinant, who fought at Hastings, is at Durham when the city falls to English ‘rebels’ and swears vengeance when he only just escapes with his life. The book centres on treachery concerning Harold’s burial but starts and ends with thrilling, action packed battles. There is copious period detail and the use of Old English adds authenticity. 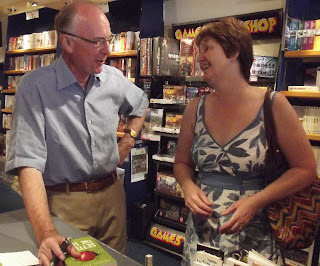 The author convinced even this Harold supporter that his characters had some right on their side and I thoroughly enjoyed this, the first in a series. Now to our next signing. Well here we are with a few more shots of the Settling the Score signing with Peter Gibbs including a rare shot of me. I'm usually behind the camera. 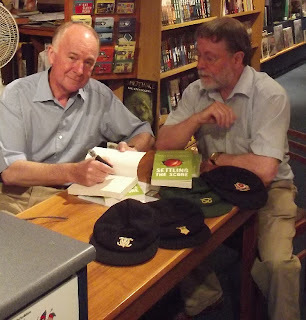 The caps are all from Peter's cricketing days. The gentleman below looks as if he checking the spelling. 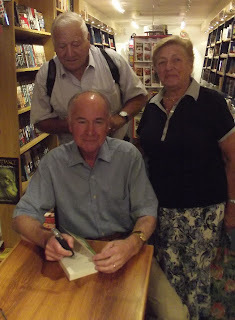 We had a great day and I'm sure that everyone who has a copy of Peter's book will enjoy it. Thank you Peter. It was a great day! And I've just had the last of the sandwiches! I promised to try to put some photos on the blog from our terrific signing yesterday as soon as possible. 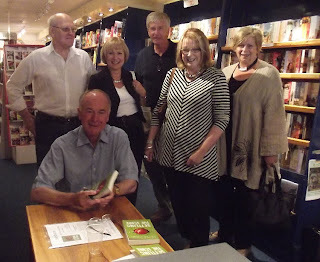 Here's one with Peter Gibbs in front of his wife Carol, surrounded by a group of friends who had come to lend him support and eat our sandwiches. However, that's all for now, more later, for a beer and a barbecue beckon, not forgetting another wonder of the world - sunshine. 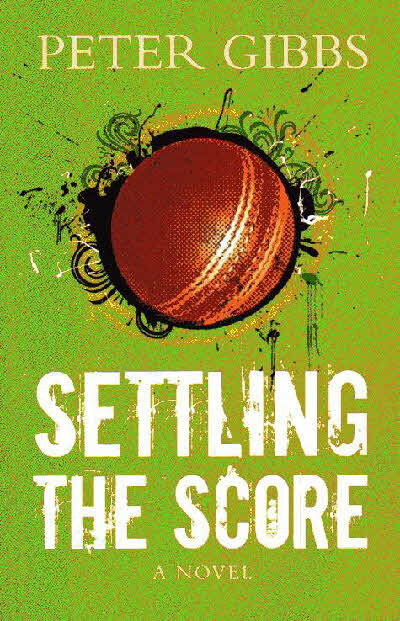 Because Settling the Score has been selling so well, we have placed yet another order. We hope another pile will arrive tomorrow morning or else we may run short. Apart from that, we think everything is ready for the signing. 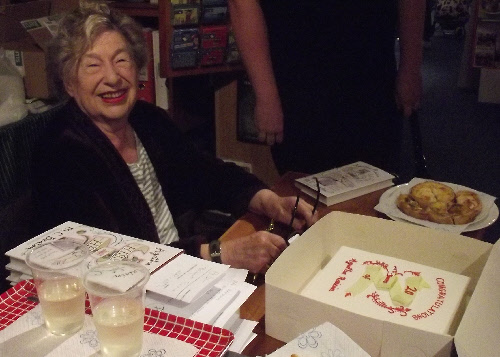 The shop has been re-arranged and, most importantly, sandwiches and cakes are organised. So, don't forget, play starts at 10.30 am. If you can't be here, phone or mail us. Here's Peter Gibbs again with the ball driven past the bowler. Or do you think he missed it? A Cricketer's tea will be served and we have a pile more books coming in because it's already selling so well. 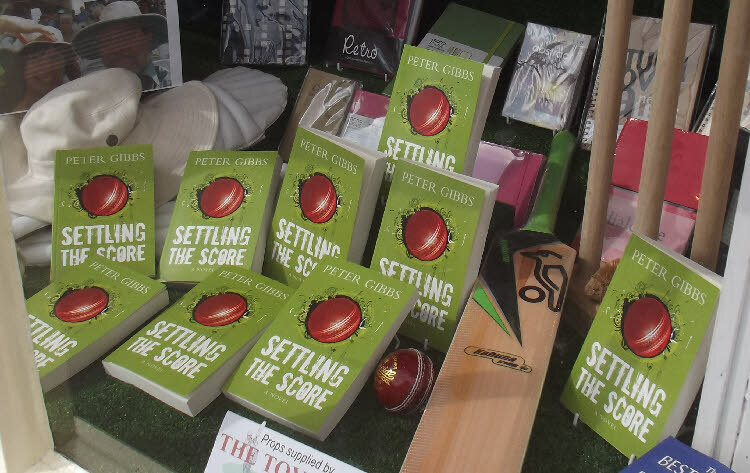 This excellent novel, based around a county cricket match, will make a great Chistmas or birthday present for anyone interested in the game. If you're a fan yourself, do come along and have a chat to Peter Gibbs, who opened for Derbyshire. Here's Peter Gibbs in full flow with the bat before he exchanged it for the pen. Note the lack of a helmet. From that you can judge that he'll be courageous enough to answer any questions you may have for him. Well, at last I did it. I remembered to fetch the camera in to work AND actually remembered to take the picture. So that's our Settling the Score window. Actually, only part of it. The book has been selling so well, we've had to snitch a few from the window to give to our customers. 20 more copies arrived today but with the advance bookings, they won't last long. I'll order some more tomorrow. Peter Gibbs called in, as he'd promised, and entertained us with a few stories from the cricket field and from his life as a playwright. Here he is, relaxing after a long innings. OK. So I promise that tomorrow, I will take a photo of our Settling the Score window. 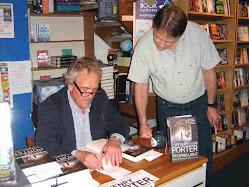 Peter himself hopes to look in tomorrow from his home in Shipston on Stour so perhaps we'll have a photo of him too. David did the window for our signing Saturday for 'Settling the Score' late today. 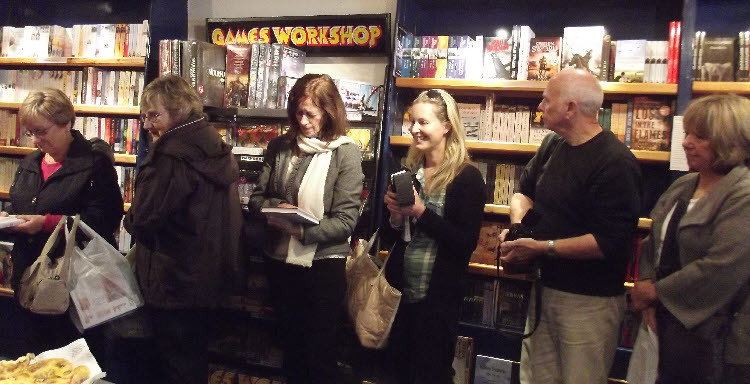 It was my intention to put a photo on the blog but, twit that I am, I'd left the camera at home. 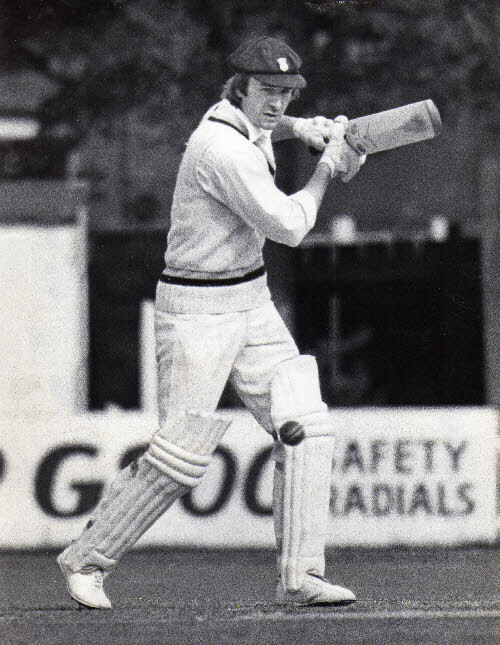 However, that give me two opportunities to mention the signing for this excellent book by Derbyshire ex-opener, Peter Gibbs. Here's the window that got a bronze. Tomorrow we'll get on with a window for our first book signing. That's Settling the Score by Peter Gibbs. 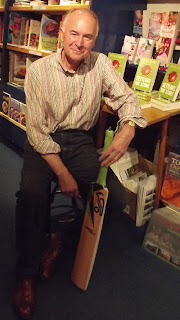 We have the stumps, the pads, the bat and the ball, all from Moreton's wonderful Toyshop. 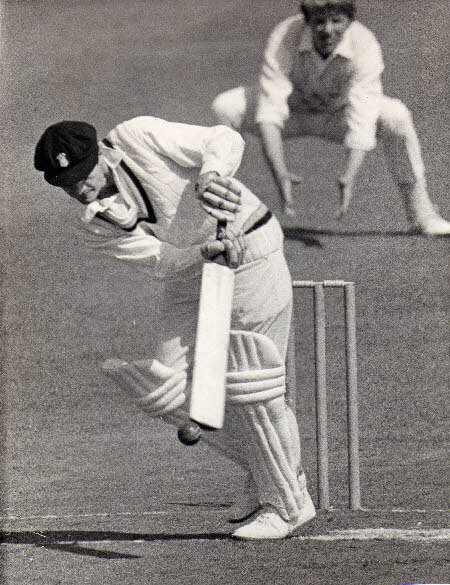 We also have a wide brimmed cricket hat - one of mine. 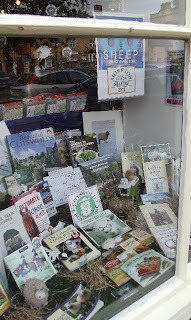 There were 60 sheep in the window including our logo and an excellent cartoon by John Curtis. The theme was sixty sheep because of the 60th anniversary of the Show. 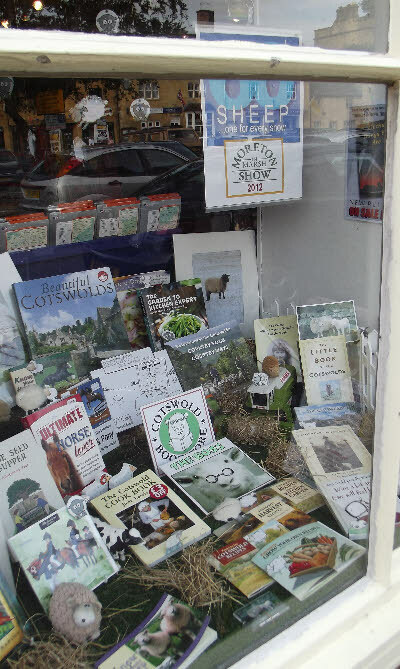 We were told by the Health and Safety people to put a notice in the window advising people not to try counting the sheep. They'd had reports of people being found on the pavement, fast asleep. I still have no idea why this post has generated such interest but while you are looking at it, let me take advantage. 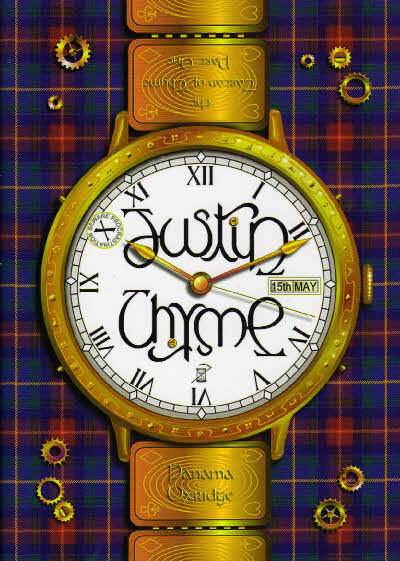 Please dig around this blog for items on a fantastic book called Justin Thyme and its sequel, Thyme Running Out. It really is the most excitingly different book I've come across. Go out and buy one - you'll see. The author is Panama Oxridge except he isn't really! 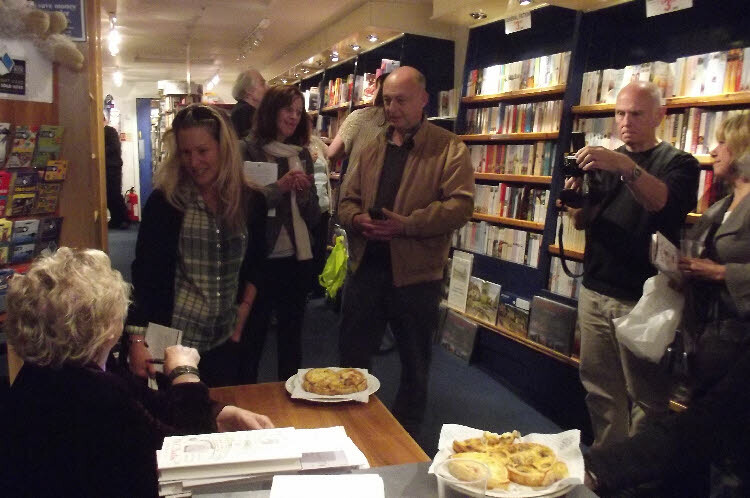 We've had huge success with it so if you know a bookseller, tell them all about it.